As writers, why should we attend writing conferences? Are they worth our time and money? Can conference workshops help us resolve a technical issue or figure out how to get our work to people who will publish it? Or, are conferences just another way to procrastinate and avoid putting fingers to keyboard or pen to paper? Are they just another way to do a lot of talking about writing, while not actually getting much writing done? 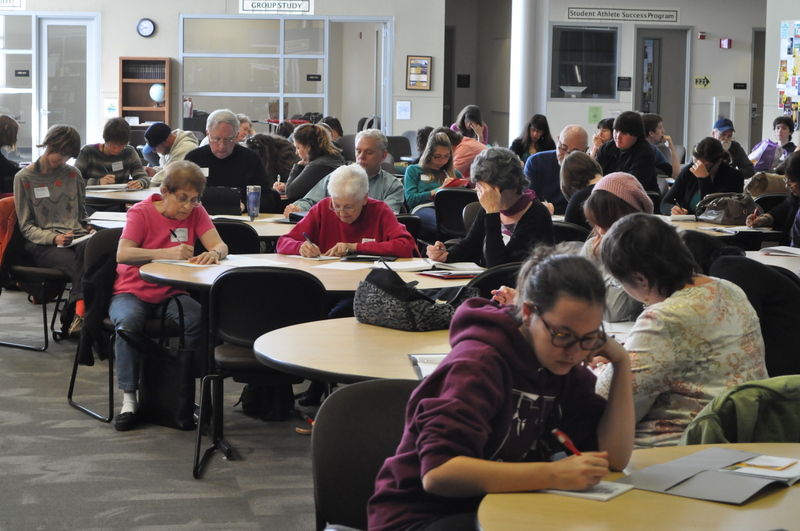 In hopes of answering some of these questions, two of our Haberdasher staff, Jodi Scheer Hernandez and Chloe Butcher, attended the WordFire 2014 writing conference at Butte College on April 26. Below, you’ll find their reflections on this one day event, which featured thirteen author-led workshops and a panel on publishing. WordFire 2014 was definitely a blast. One of my favorite writing prompts of the day came during the opening ceremonies. Everyone was given the task of creating a ‘post it note’ poem similar in style and structure to William Carlos Williams’ “This Is Just to Say.” Williams’ poem is a halfhearted apology for eating fruit he knows he wasn’t supposed to eat. Reading his poem inspired me to write a fictional poem about my twin sister. My halfway apology was about leaving an empty conditioner bottle in the shower, which she found out when she was rushing to get ready. The prompt was an easy and fun way to start a writing-filled day. Before I went to Susan Wooldridge’s poetry workshop, “Freeing Your Life with Words,” I thought I would hate it. I’ve never really liked poetry, but the title of her workshop made me want to give it a chance. As it turns out, poetry truly can be a fun and creative way to pass the time. Wooldridge didn’t take the usual approach that I expected, which would somehow involve the workshop leader telling me to “look deep inside myself” and “really reflect on how to express myself through the beautiful gift of the English language.” Instead, she gave us an exercise where everyone found words that stood out to them, and then the group created a big list of words. By taking away the need to be readily introspective, I found that I enjoyed myself more and had an easier time connecting with everyone else. 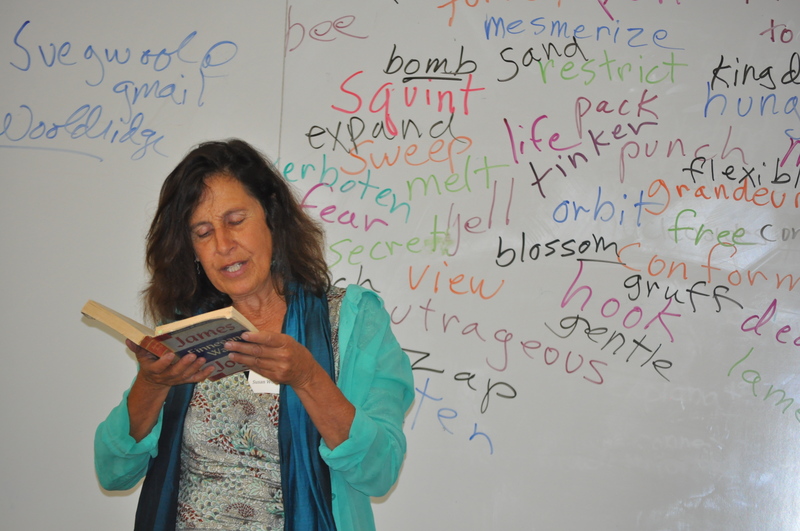 As the workshop continued, I was surprised to feel the words flow out of me as I attempted to write a poem. One thing that Wooldridge’s poetry workshop helped me with is that, as a writer, I spend way too much time in my own head worrying about how intellectual or academic what I am writing may sound. Out of the four workshops I attended, Finn Kraemer’s “Prompting a Story” had the biggest impact on me. His simple, no nonsense take on writing really opened my eyes, and was just the kick I needed to stop blaming my difficulty with writing on anything but myself. One of his key points was that we need to take control of our writing. We often think that writing comes from a magical unattainable place, but it really comes from us. We are the people that make the decisions on how a story or essay will develop, and the decisions that we make about those developments don’t come from a fairy who occasionally taps us with inspiration. Kraemer’s argument that we need to get serious and take control of our writing really inspired me to change the way I approach future projects. The combination of writing various pieces “on the spot” and being around so many people who share my passion for the English language was invigorating. My favorite part of the conference wasn’t all of the tips and ideas that my workshop leaders gave me; it was the renewed inspiration and love of English the day rekindled in me. 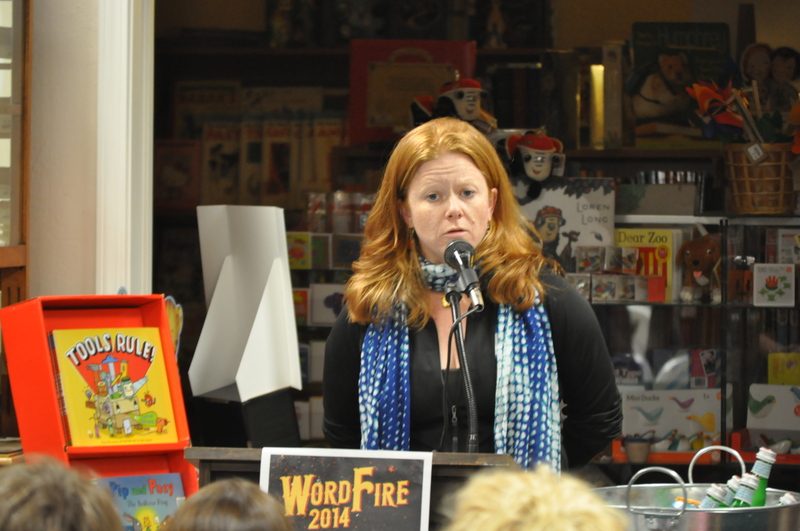 I was very pleased to be able to attend the WordFire writing conference at Butte College this year. Kiara Koenig led my first workshop of the day. She was insightful, witty, and a joy to learn from as she presented, “The Writer’s Uncertainty Principle: Imitation, Influence, and Invention.” I scribbled notes anxiously and enjoyed seeing others have the experience of her wit and intellect. The workshop focused on recognizing in other writers what we like or do not like in our own writing, as well as delving into our expectations of what we look for in one genre when reading another. The Stephen King quote, “If you want to be a writer, you must do two things above all others: read a lot and write a lot,” best sums up the main message of Koenig’s workshop. Her workshop left me hungry for more knowledge and inspiration, and it was on to the business of writing a memoir. 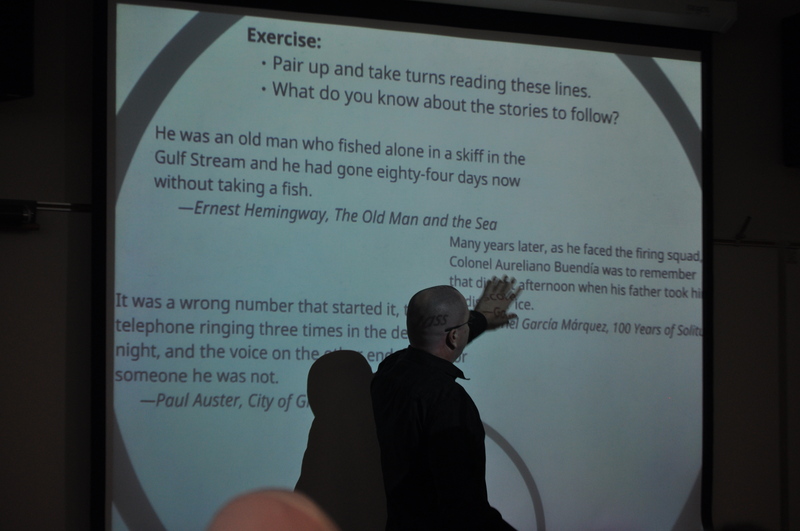 Neal Snidow’s workshop was titled “‘Curved Space’ in the Memoir.” One of Snidow’s key points was the use of anchors, as in points of origin to tell the story and give it boundaries. He offered the example of characters who come in at key points and help move the story along. Though these characters may never be seen again throughout the memoir, they can be forces that drive the story forward. I got down a few notes that could help drive forward a memoir of my own someday, and realized I may have a fairly interesting story to develop. As the session closed, I was getting pretty hungry, so it was a good thing we were off to lunch. Lunch was tamales and Spanish rice. There were three kinds of tamales, beef, chicken and vegetarian; I tried one of each. I was hungry; what can I say? The food was decent enough, but by the time I got there, the salsa had been devoured, and there was just a tiny bit of sour cream left. To our rescue came one of the professors offering bottled hot sauce that he had quickly procured from his desk. Now our bellies were full, and, oh dear, that was a lot of carbs. Maybe I should have only had one tamale. Still, it was on to the panel on publishing. 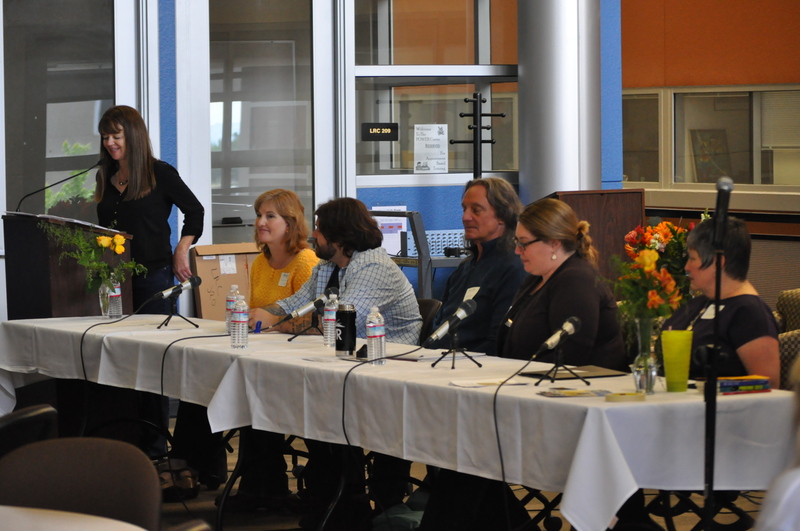 The panel, made up of authors, editors, and independent bookstore owner, Heather Lyon, discussed topics ranging from getting poetry published to the idea of a predatory publisher vs. an editor. While one of my table-mates found some of the answers to the audience’s questions discouraging and frustrating, I was quite happy to hear the honest and realistic views from the panel. I appreciated the candor and realistic points the panel put across about self-publishing, getting published, and the hard work of finding the niche or genre for each specific piece of your work. The hour went by quickly, and we moved on to our final workshops. I chose C.G. Watson’s workshop, “Magical Realism for Young Adults.” I had at first been hesitant to attend this one, because I really didn’t want to discuss things like Twilight and Harry Potter. I did however want to explore writing for adolescents and young adults, so reluctantly I entered the discussion. I was surprised and pleased that I chose to attend. Watson, a high school teacher and published novelist pulled me in with her look at the genres of the paranormal. While the discussion inevitably touched on the series I mentioned before, I came out with some interesting and new ideas, plus inspiration for a vehicle to carry my story that could draw attention from young readers. I really enjoyed her workshop, and would love to talk with Watson more in the future. At day’s end, I was left with a new energy for writing. As we wrapped up with some chocolate and the short prompt, “I write because…,” ideas and images were coming at a rapid rate. Humbled by the skill and humor of the people I encountered, I left the conference encouraged to strive harder. I cannot wait to attend again next year. For anyone in the North State interested in writing, this is definitely a must attend event. Now that you’ve heard some of our thoughts on the benefits of conferences, feel free to share yours in the comments section, including best (or worst) conference experiences, conference recommendations, or a conference wish list of ideal presenters, workshops, menus, and locations.